During development, we discovered that although WPF technology has many advantages, it utilizes a lot of computer resources. Therefore, creating a high quality and high performance product requires significant developer experience and deep understanding of technology. Out developers have invested of lot of effort in GridControl and as the result it has all the advantages of its predecessor, .Net Grid, including high performance. We have preserved thread safety of dynamic data in non-graphical thread enabling implementation of a thread-safe event-driven model. GridControl is the only graphical component that is able receive notifications (price changes or any other information) from the business model and from any thread.However, we mainly focused on ease of use, intuitiveness and minimization of code volume in final application. As the result, the grid supports any data types, creating any kind of hierarchy, sorting, filtering and grouping. All of these features require just a few code lines. The Wpf GridControl is the only component providing real-time services of simultaneous data grouping, sorting and filtering. This problem is very complex for developers to solve. As example, imagine blotter displaying several dozens shares sorted by constantly changing percentage of price fluctuation. In addition to that, users can apply filters to display only shares with the highest price change. A lot of complex and inefficient code is required to implement this functionality in other grid. Our GridControl has integrated data sorting, filtering and grouping services that continuously display rows in correct order even when they change all the time. We have also moved the feature of short-term cell blinking from .Net Grid to the new product. 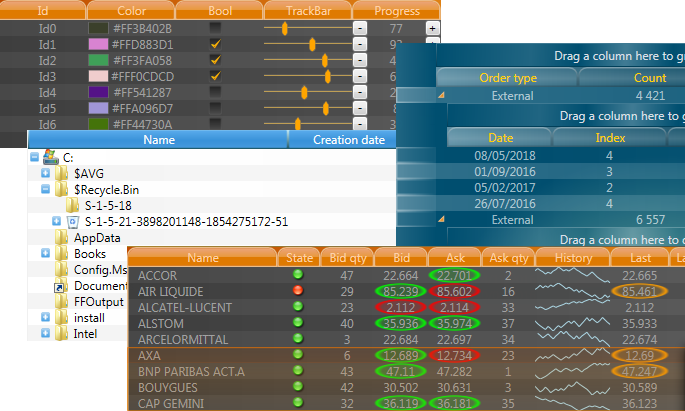 Users can set highlighting color and duration for individual cells using the provided callbacks. We haven’t forgotten about specific advantages of WPF technology and now our application can display any controls in grid cells with DataTemplate and DataTemplateSelector. You can also alter grid appearance easily using preset or custom styles. We hope that you will be surprised by outstanding quality of our work and really appreciate it. We believe that our products will deserve your attention and that with our help you will develop excellent high-performance user-friendly applications.